Most towns and cities in Galicia also celebrate Easter week and Ferrol hosts one of the most traditional and spectacular Easter events. The port city of Ferrol is the starting point of the Camino Ingles, a Camino de Santiago route traditionally followed by pilgrims from Britain and Ireland. 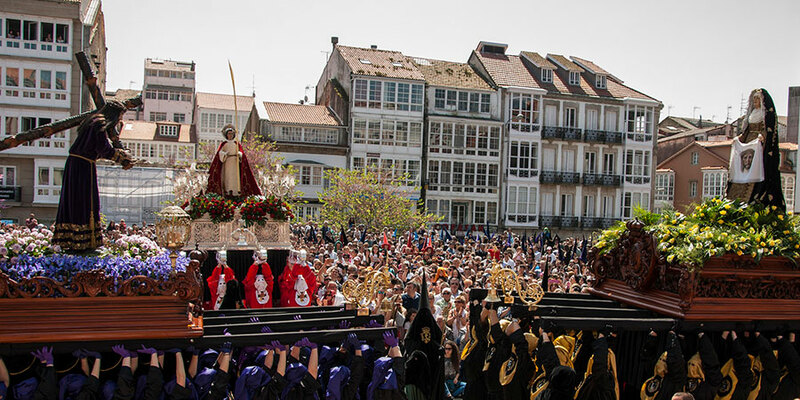 Easter would be the perfect time of the year to start the English Camino in Ferrol, experiencing the city’s most important event of the year and walking to Santiago de Compostela, where there are also colourful Easter processions all week. You can walk from Ferrol to Santiago in just one week. 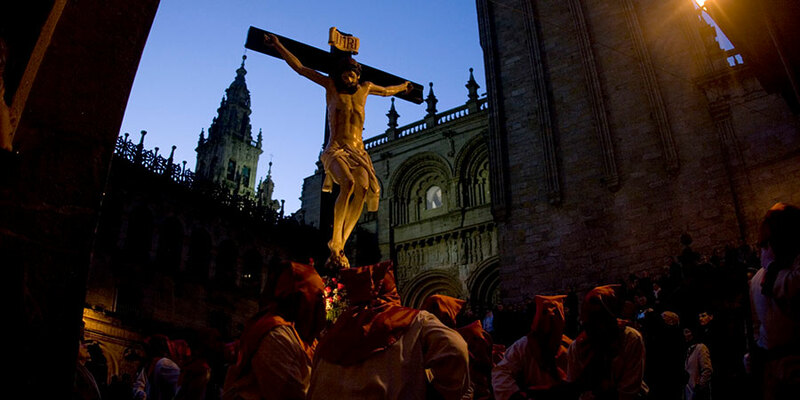 As capital of Galicia and destination point of the Camino de Santiago, Santiago de Compostela also hosts its own Holy Week processions with religious imagery hitting the streets for locals and visitors to admire in the beautiful setting of Santiago’s Old Town. Another city on our list for a very special Easter week is Lugo. Holy Week parades in Lugo take place in the old town, nestled within the city’s famous Roman wall, the best preserved Roman wall in Europe and a UNESCO World Heritage. Lugo is the starting point for the second section of the Original route of the Camino de Santiago. For a Camino Easter with a maritime feel, you should head to Fisterra and experience Holy Week in the heart of the Costa da Morte. The focal point of celebrations is the Church of Santa María das Areas and the Saint Christ of Fisterra, popularly known by the locals as ‘The Golden Beard Christ’. Locals also reenact some of the scenes of the Passion as part of the week’s proceedings. Easter, along with the colourful Feria de Abril, is the most important and unique festival of the year in this stunning city. Processions and floats with religious sculptures representing the Passion of Christ, called ‘pasos’, parade around the streets, with the most dramatic ‘pasos’ on display for Holy Thursday and Good Friday (or Holy Friday).Enchanting Seville, starting point of the Vía de la Plata, is home to the most impressive and world-famous Holy Week in Spain. Also along the Vía de la Plata Camino de Santiago route, the cities of Salamanca and Zamora host important Holy Week processions. Hi Cathryn, Pamplona would be a good place to stop for a couple of days and see the Easter processions. I hope this helps! No problem, we have just removed you from our email list. Bye ! can you please remove me from the email list – I’m not really interested in receiving this information.